The Culturally Relevant Computing Lab has been awarded a contract by Clarkson Aerospace, LLC to conduct research in the area of cybersecurity. The research will be conducted primarily by members of Morehouse College, Spelman College and Clark Atlanta University Navy ROTC. The contract is set at $157,000 and runs for nine months. The research to be conducted will be in the area of social media data analysis and mining. On October 3, 2017, members of the Culturally Relevant Computing (CRC) Lab at Morehouse College participated in a training workshop for LaTeX, a high tech document preparation system for technical and scientific documents. This system is free to users and is setting the standard for publication of scientific documents. Students were given an overview of the functionality and capabilities of the software, as well as offered an opportunity to answer any questions related to initiation of use. Some of the topics covered included: formatting mathematical equations; the addition of tables, figures, and pictures; overall document formatting, and how this all relates to basic coding. The workshop was facilitated by Earl Huff, Jr., a PhD student in Human-Centered Computing at Clemson University, under the advisement of Dr. Kinnis Gosha. Mr. Huff’s research areas include Human-Computer Interaction, Artificial Intelligence, and Applied Machine Learning. 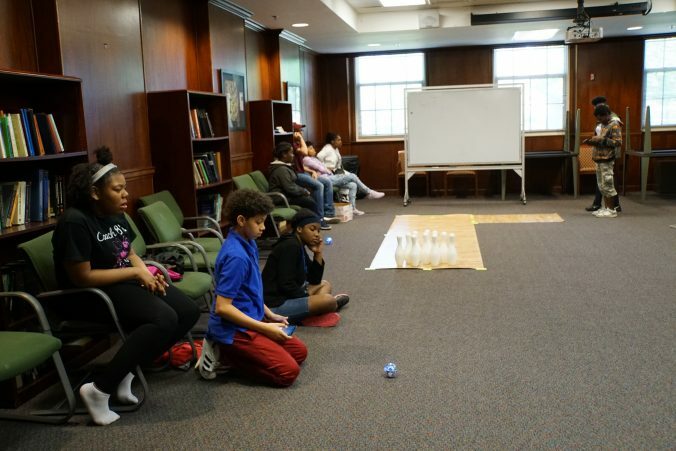 As a part of the Culturally Relevant Computing Lab, Mr. Huff is afforded the opportunity to educate undergraduate students on technologies that will be of benefit to their academic growth, while supporting the vision of the lab. Dr. Kinnis Gosha, an Assistant Professor and Director of the Culturally Relevant Computing Lab at Morehouse College, has been awarded a grant by the National Science Foundation (NSF) to conduct a study on virtual mentorship and how it impacts underrepresented minority students in the computer science and engineering fields. This grant award is for $299,882 and will span a two-year period. The central purpose of this research is to develop and evaluate a virtual mentoring system that uses a group of embodied conversational agents (i.e., think avatars) to mentor underrepresented doctoral students, majoring in engineering and computer science and who are pursuing a career as a college professor. This grant is also designed to provide guidance to minority students on the different paths available in the areas of engineering and computer science. This grant is of great importance, as minority students are underrepresented in higher education in the United States, particularly in the areas of engineering and computer science. Because of this, opportunities for mentorship in the engineering and computer science disciplines will be less scarce for interested students. Research has shown that conversational agents used for mentoring have been effective in addressing this gap in support. The NSF award positions the Culturally Relevant Computing Lab to conduct research that can potentially transform the landscape of engineering and computer science, by providing the foundation and support needed to foster diversity through virtual mentorship. 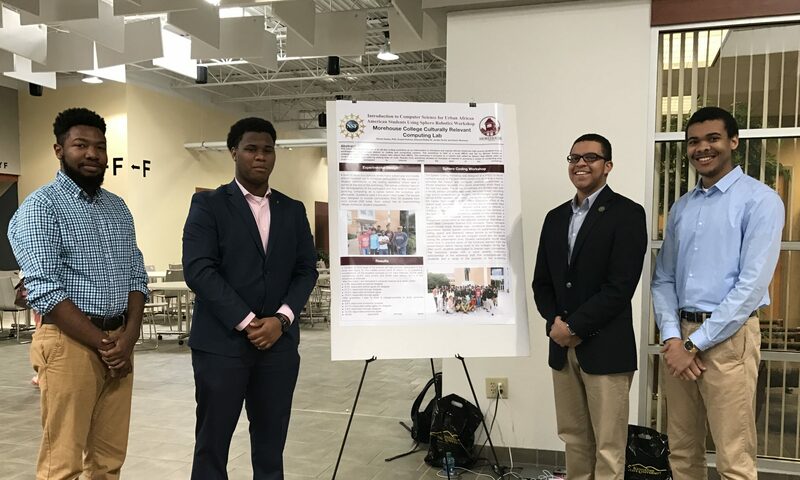 The Culturally Relevant Computing Lab at Morehouse College congratulates Ernest Holmes on receiving the Georgia CIO Leadership Association (GCLA) Scholarship. Every year, the GCLA awards an outstanding student that exhibits an interest in computer information systems or business, excels academically, and is active in community outreach. This year, this honor is awarded to Mr. Holmes. Ernest is currently a junior Computer Science major at Morehouse College, and maintains a 3.68 GPA. He has been a member of the Culturally Relevant Computing Lab, led by Dr. Kinnis Gosha, since his freshman year, and has worked as an intern at the Google Headquarters in Mountain View, California the past two summers. He spends much of his free time participating in a number of community outreach activities that serve elementary, middle and high school students that have an interest in computer science. The scholarship award will be presented during the GCLA CIO of the Year ORBIE Awards Ceremony, on November 15, 2017 at the Cobb Galleria Center in Atlanta, Georgia. Over 1,000 people from various organizations across the state are expected to be in attendance. Members of Morehouse College’s Culturally Relevant Computing (CRC) Lab have received travel scholarships to attend the ACM Richard Tapia Celebration of Diversity in Computing Conference, which will place September 20th-September 23rd in Atlanta, GA. Ernest Holmes, Kevin Womack, Nathan Harris, and Leron Julian were awarded the travel scholarships to attend the conference through support from the Institute for African- American Mentoring in Computing Sciences grant (NSF grant #1303156). Travel scholarships include conference registration, meals during the conference, and hotel accommodations. The Tapia Conference brings together undergraduate and graduate students, faculty, researchers, and professionals in computing from all backgrounds and ethnicities to celebrate the diversity that exists in computing, connect with others with common backgrounds, ethnicities, disabilities, and gender so as to create communities that extend beyond the conference, and obtain advice from and make contacts with computing leaders in academia and industry. The Tapia Conference has always been a premier venue to acknowledge, promote, and celebrate diversity in computing. This is a great achievement for our lab members. Tapia Conference scholarship applications are extremely competitive and are reviewed by over 90 professional volunteers in computer science industry and academia. Congratulations to these students! Culturally Relevant Computing Lab Director, Dr. Kinnis Gosha, and Google software engineers, developed a course for Morehouse students to learn Android Application programming, along with the Applied Computer Science(CS) content, and received hands-on experience in a for-credit class. The course, titled “Mobile App Development with Advanced Data Structures,”combined lecture, class discussion and in-class assignments targeted at learning Java, advanced data structures, ADS, and other basics for Android programming. 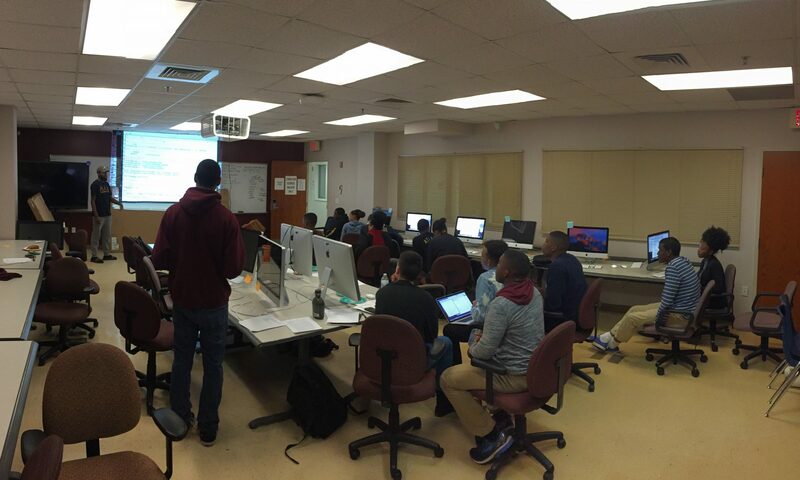 The Applied CS classes ran for 75 minutes and were held twice a week for 16 weeks in the fall semester of 2016. These classes, the first at the university for mobile app development, filled up quickly due to the buzz around the collaboration with Google, and 11 out of 12 students successfully completed the course. Dr. Kinnis Gosha is one of the 31 HBCU Computer Science faculty members selected for the inaugural HBCU Faculty in Residence program. 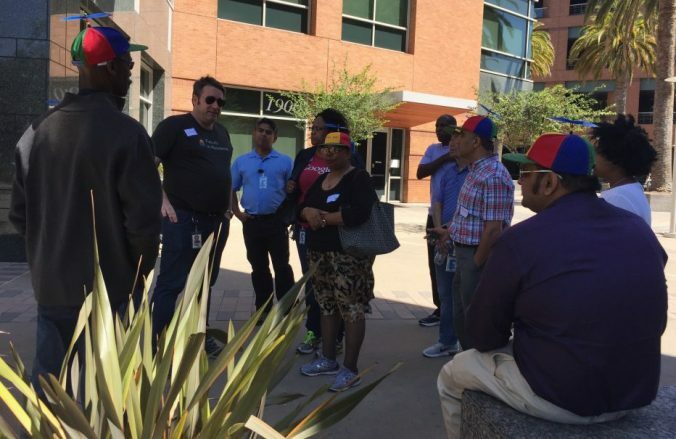 Over 20 HBCUs are represented in this six-week program at Google’s world headquarters in Mountain View, California. Faculty will work to redevelop curriculum to better align with the latest trends in software engineering. It is no secret the demand for people with information technology and computing skills is growing nationwide, and students are never too young to learn the necessary skills to help land you a career in that field. 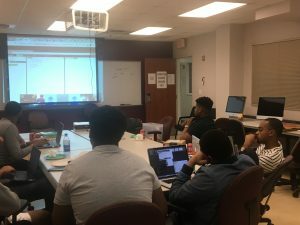 Morehouse College and Atlanta Public Schools are doing their part to expose high school student to computing careers through a 4-week coding workshop. The Xanadu-Computer Application Development/ X-CAPP Summer Program will be offered to rising 10th-12th grade students from June 5 through June 29. During the camp, students will also be able to familiarize themselves with various computing careers through the ComputingCareersNow.org portal which was developed by Gosha in the Morehouse College Culturally Relevant Computing Lab. For more information about X-Capp, please visit http://www.atlanta.k12.ga.us/Page/911 or contact the Xanadu Middle/High Program at 404-802-7585. See the original CBS46 News Story here. X-Capp is a highly competitive and selective academic computing program that will be offered from June 5, 2017 through June 29, 2017 at Maynard Jackson High School and Morehouse College. Students must be rising 10th – 12th graders with an interest in pursuing a degree in computer science after graduation. Registration will take place on Friday, May 19 at the Campbell Building (21 Thirkeld Avenue SW, Atlanta) from 9:00 a.m. to 3:00 p.m.
Friday, May 19, 2017 – 9:00 a.m.-3:00 p.m.
What is the Xanadu – Computer App Development Program? It is highly competitive and selective academic computing program that will be offered from June 5, 2017 through June 29, 2017. Students must be rising 10th – 12th graders with an interest in pursuing a degree in computer science after graduation. Students do not need to know how to write computer programs to participate. Preference will be given to applicants who attend an APS High School and have limited exposure to such a program. Seats are limited. Who is eligible to participate in the Xanadu – Computer App Development Program? All gifted and talented eligible/high achieving students in the metro Atlanta area who have successfully completed ninth grade and who also meet program criteria are eligible to participate. This program is highly competitive. What are the criteria for acceptance into Xanadu – Computer App Development Program? This program is designed for gifted and high achieving students. Supporting documentation is required as outlined below and must be submitted at registration. Supporting documentation will not be returned. Please make all copies prior to submission. I am an APS employee; my child does not attend APS. Can I enroll my child in Xanadu – Computer App Development Program? Yes, children of APS employees are eligible to apply for acceptance into the program as long as they meet program criteria. Students of APS employees pay the Non-APS Student rate. Can students of APS charter schools participate in the Xanadu – Computer App Development Program? Yes, children of APS charter schools are eligible to apply for acceptance into the program as long as they meet program criteria. Charter students pay the non-APS student rate. When will I receive notification verifying my child’s acceptance or non-acceptance into the program of application? A letter of acceptance to the program will be emailed on Monday, May 22, 2017 by 5:00 pm. What is the content of the program? communication, collaboration, and creativity. Participants will not receive academic/course credit. How are the instructional programs organized? Is transportation provided to the Xanadu – Computer App Development Program? No, APS bus transportation is not provided to Maynard H. Jackson High School. What is the application and registration process for the Xanadu – Computer App Development Program? 1. Complete the online application which is available at https://www.surveymonkey.com/r/XanaduAppDevelop. Completion of this application DOES NOT secure placement in the program. 2. Secure the program fee in the form of a money order or cashier’s check made payable to Atlanta Public Schools. Personal checks and cash will not be accepted. The submission of supporting documents and receipt of program fees secure consideration of placement in the program. We will refund 100% of all program fees if the applicant is not selected for X-Capp. 3. Registration takes place in person on Friday, May 19, 2017. Bring copies of supporting documentation, and the program fee to the Campbell Building 21 Thirkeld Ave. SW Atlanta, GA 30315. Money orders and cashier’s checks are the only acceptable forms of payment. No cash or personal checks will be accepted. Please bring payments made payable to Atlanta Public Schools with the student’s name written on the method of payment. Is there a discount for families enrolling multiple children? No, multi-student discounts are not available. Are school meals provided Xanadu – Computer App Development Program? The school meal program operates on-site during the program. Atlanta Public School students and its charter school students eat breakfast and lunch at no charge during the program regardless of meal status during the academic year. Non APS students will be required to pay for meals at a rate of $4 for each lunch and $1.50 for each breakfast. Students will not be permitted to charge meals. Parents will be contacted in the event a student requires a meal but funds are not provided. Students may bring their own lunch from home. What is the policy regarding cancellation? If cancellation is made on or before May 26, you will receive a full refund minus a $25.00 processing fee. No refunds will be made after this date. To cancel your registration, call 404-802-7585 and email a letter of cancellation to Xanadu_Gifted@atlanta.k12.ga.us. Include your child’s name, the program registered for, and reason for cancellation. Please allow 14 days for refund processing. If you have any additional questions, feel free to email the Office of Gifted and Talented Education at Xanadu_gifted@atlanta.k12.ga.us.